Solitaire Windows Doors come armed with a vast array of security features and Security Accreditations. They are all covered by the official Police-preferred high security specification, Secured by Design. This is an initiative managed by the Police, and backed by the Home Office, to help homeowners choose doors that meet the highest standards in security and crime prevention. Solitaire Windows Doors are manufactured in Northamptonshire using the market leading British Profile 22 PVC-U System extruded in the Midlands. Your Doors are reinforced with a unique high strength Recycled Composite Material wherever possible, as opposed to carbon inefficient steel or aluminium reinforcing members. 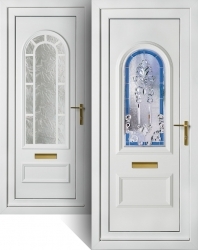 Beautiful looking PVC-U doors that improve the look of your home too. Solitaire Windows Doors are also manufactured using electricity from Solar Photovoltaic renewable energy sources. You can choose from a wide variety of styles ranging from classical looks to modern contemporary designs, together with a stunning choice of colours and glass options. Toughened glass is also a standard feature, and stainless steel hinges eliminate unsightly rust. Maintenance Free PVC-U Doors. All Solitaire Windows doors are virtually maintenance free, with insulation figures up to six times better than timber frames. Not that advanced PVC−U is only a substitute for timber. If you have ageing PVC−U or aluminium products, then you'll enjoy similar improvements and cost savings by upgrading your doors. Working together Solitaire Windows and Rock door can give you the ultimate in security in your home. Rockdoor composite doors combine attractive design with industry-leading security and outstanding thermal efficiency, ensuring that every Rockdoor is a stylish addition to your home. 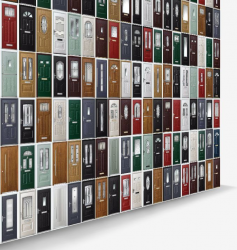 As well as front doors and back doors you can also choose from a range of stylish stable doors and French doors, so you can get the Rockdoor you need for your home. When you have a Rockdoor composite door fitted, you’ll get the reassurance and peace of mind that your home is safe, secure and warm. We understand that you may not share our passion for composite doors, or know which Rockdoor you need just yet. You might also want help determining the importantance of Energy Rating and Security Ratings for composite doors.